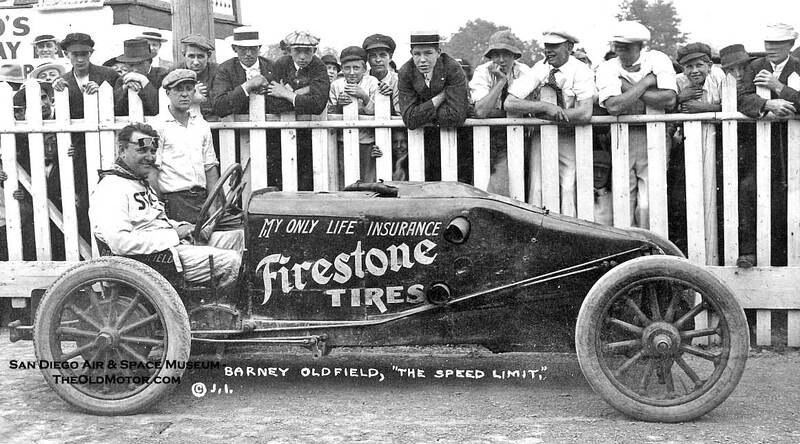 Berna Eli “Barney” Oldfield (January 29, 1878 – October 4, 1946) was an American pioneer automobile racer; his “name was synonymous with speed in the first two decades of the 20th century”. After success in bicycle racing, he began auto racing in 1902 and continued until his retirement in 1918. He was the first man to drive a car at 60 miles per hour on a circular track. At age 16, Oldfield began serious bicycle racing in 1894 after officials from the “Dauntless” bicycle factory asked him to ride for the Ohio state championship. Although he came in second, the race was a turning point. Oldfield was lent a gasoline-powered bicycle to race at Salt Lake City. Through fellow racer Tom Cooper, he met Henry Ford, who was at the beginning of his career as an auto manufacturer. Ford had readied two automobiles for racing, and he asked Oldfield if he would like to test one in Michigan. Oldfield agreed and traveled to Michigan for the trial, but neither car started. Although Oldfield had never driven an automobile, he and Cooper bought both test vehicles when Ford offered to sell them for $800. One was “No. 999”, which was debuted in October 1902 at the Manufacturer’s Challenge Cup. Today it is displayed at the Henry Ford Museum in Greenfield Village. Oldfield agreed to drive against the current champion, Alexander Winton. Oldfield was rumored to have learned how to operate the controls of the “999” only the morning of the event. Oldfield won by a half mile in the five-mile (8 km) race. He slid through the corners like a motorcycle racer rather than braking. It was a great victory for Ford and resulted in both Oldfield and Ford becoming nationally known. On June 20, 1903, at the Indiana State Fairgrounds, Oldfield became the first driver to run a mile track in one minute flat, or 60 miles per hour. Oldfield, his manager and agent traveled throughout the United States in a series of timed runs and match races, and he earned a reputation as a showman. Oldfield was the first American to become a celebrity solely for his ability to drive a car with great skill, speed, and daring. He liked to increase the drama in best of three matches: he would win the first part by a nose, lose the second, and win the third. Oldfield won first place at the Indianapolis Motor Speedway on August 21, 1909 in a Mercedes Benz. He bought a Benz, and raised his speed in 1910 to 70.159 mph. 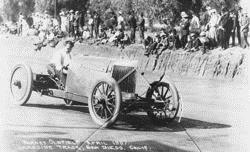 At Daytona Beach, Florida, on March 16, 1910, he set the world speed record, driving 131.724 mph. This entry was posted in Barney Oldfield, Ford Model A, Model T Ford, Vintage Cars on February by Jon Wilson.